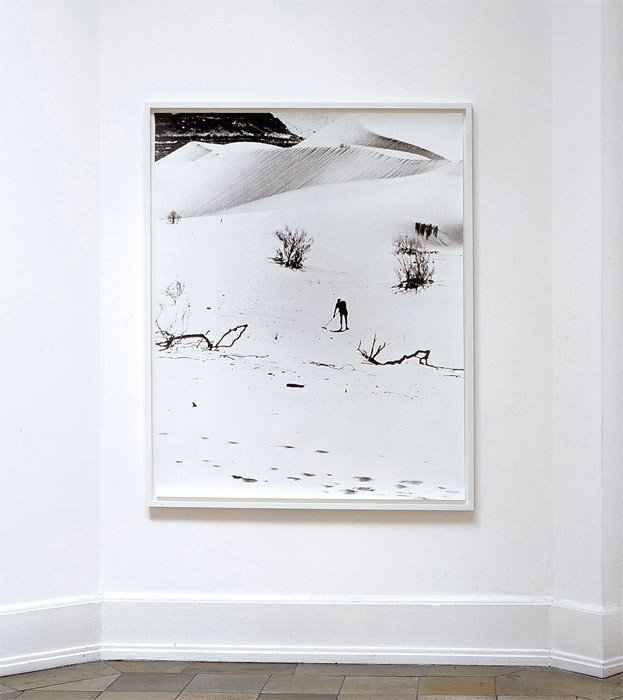 Jan Timme, Sweeping the Desert (detail), 2007, two black-and-white framed photographs, 61 1/2 x 50 1/4“ and 27 1/2 x 32”. LIKE MANY CONTEMPORARY ARTISTS, Jan Timme is committed to engaging the history of the discursive formations and practices that have shaped advanced art since the early twentieth centurybut he does so on his own terms, without succumbing to nostalgia, academicism, or simple emulation. In his installations, photographs, sculptural objects, wall writings, films, and audio pieces, the Berlin-based artist often deploys the ironic attitude of the homo ludens to respond to the history of the readymade and to Conceptual and site-specific art of the 1960s and ’70s. Take Sweeping the Desert, 2007, for example, for which Timme appropriated a black-and-white photograph of a laborer prepping the sand for a scene in the film Lawrence of Arabia (1962). Timme’s recontextualization of this solitary man evokes multivalent associations: The anonymous worker is an heir both to Sisyphus and to the lonely figure in a Romantic landscape painting, and also a kind of Land artist avant la lettre. 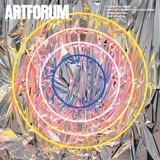 As presented in the group show “Romantic Conceptualism” at the Kunsthalle Nürnberg in Germany in 2007, the image also reflected on its own connection to the debates leading up to this exhibition’s attempt to reevaluate the history of Conceptualism: Timme had used the photograph for the cover of the journal Texte zur Kunst’s special issue on Romanticism and now rephotographed and enlarged a section of the image for the Nuremberg show. Shortly before the opening, he made yet another, smaller print, for which he reproduced a detail from the picture already installed in the kunsthalle, bringing the camel’s hoofprints in the foreground to the verge of abstraction; this print was then hung, too, in a different room. The reference to David Lean’s epic movie thus provided the impetus for a far broader reflection on the convoluted network of relationships between the semiotics of the photograph, the readymade (whose analogy to the snapshot was famously discussed by Marcel Duchamp), and strategies of site-specificitywhile also acknowledging the ongoing need to take into account the institutional space of display as a “non-site” of the type defined by Robert Smithson. Timme also took up the material basis of the site of installation for Untitled, 2007, a work shown that year at Galerie Christian Nagel’s booth at Art Basel Miami Beach. He had noticed that when exhibitors at Art Basel in Switzerland required white paint, the fair’s organizers provided it in tin cans that used to contain beef bouillon. For the Miami presentation, Timme constructed a plinth, which he painted with the contents of one of these cansalthough there was not enough paint for the whole structure, so he left a section unpainted. He then placed the can itself atop the plinth in a Plexiglas housing. The work that resulted from this process thus not only referenced figures such as Jasper Johns, Andy Warhol, Haim Steinbach, and Rachel Harrison but also commented on those aspects of site-specificity that are inadvertently rehearsed at every art fair during the installation of work by a host of artists with quite different concerns. At the same time, Timme’s piece extended the negotiation of the use- or exhibition value of industrially produced objects that has underpinned the readymade since its inception. In Timme’s earlier works, clearly identifiable art-historical references (also, for example, to Bas Jan Ader, Christian Philipp Müller, Fareed Armaly, and, time and again, Duchamp) and citations of pop-cultural phenomena (such as lyrics from songs by the Smiths and stills from Buffy the Vampire Slayer) were weighted toward their formal, linguistic, and anecdotal qualities. Increasingly, however, formats, morphologies, and media are assuming greater importance than specific art-historical or cultural references. Such references, when they are still present, primarily serve as means of setting in motion wider reflections on the evolving repercussions of the paradigm shift from the supposedly self-contained work of art to an emphasis on the experience of viewers in time and space. 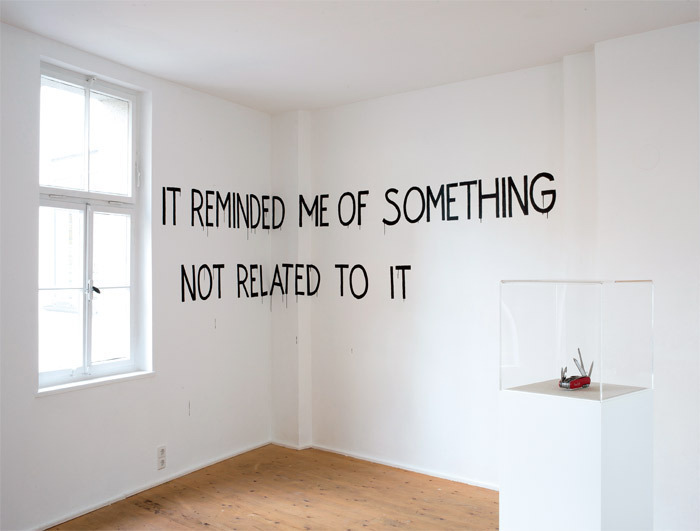 A phrase Timme wrote on the wall of his 2010 show at Hermes und der Pfau in Stuttgart, Germany, can thus be considered programmatic for the artist’s recent production: IT REMINDED ME OF SOMETHING NOT RELATED TO IT. Ambiguity and the open question of how artistic meaning is created are now privileged, rather than the significance that can be summoned by the use of preexisting motifs or slogans whose effects are already codified. For the same exhibition, Timme produced a poster announcing A NEW PLAY BY JAN TIMME and picturing an eye mask, which was pasted onto a concrete wall in the backyard of the institution and in the stairway leading to the show itself. Although the title of the imaginary playI COULDN’T BEGIN TO EVEN THINK ABOUT KNOWING HOW TO ANSWER THAT QUESTIONis lifted from the 2001 film The Royal Tenenbaums, Timme uses the sentence primarily to signal the deferral of referentiality within the work itself. It is aimed less at creating a particular context than at involving the passing viewer in the self-reflexive reconstruction of a counterquestion. Similarly, One, Two, Three, . . . , 2005/2010, a work based on three prints of a photograph of the drummer in the German band Tocotronic, appeals to the beholder’s experience more than to the concert as an event, the person depicted, or the social context of this influential rock group. The set of three photographs, which are characterized by yellow, red, and blue stage lighting, was itself distributed among six separately framed parts. The hanging thus reproduces the sense of rhythm and timing evoked by the work’s title, creating a synesthetic loop that repeatedly returns the beholder to creating the connections between what he or she can only imagine and what is “actually” perceived. View of Jan Timme: Chapter Two, 2010, Hermes und der Pfau, Stuttgart, Germany. Photo: Bernhard Kahrmann. Many of Timme’s recent concerns are developed to their most potent and concentrated form so far in his newest installation, We’re one but we’re not the same, 2011, which aims to test the execution and implementation of this kind of aesthetic experience as such. At first glance, the work looks like the apparatus for a scientific experiment. Three round mirrors are mounted on metal stands at different heights and varying angles of inclination. Their reflective surfaces are turned toward one another and arranged in a space that the viewer can entera triangular zone that is at once open and circumscribed. The constellation of mirrors and their mutual reflections means that there is a point where the viewer sees him- or herself exclusively from behind, in an infinite regress. If the Minimalists situated the viewer at the interface between object and architecture, Timme’s installation heightens this effect. Indeed, it renders physically inescapable the (doubly) reflexive engagement with the parameters that make up the installation, even as it constructs a situation from which there is always already an outlet: At any moment, the cycle of endless reflections can be brought to an end with a single step. The process of viewing the work can be repeated but is never identical. It is, moreover, a process that literally leads the viewer back to him- or herself, one that brings the self and the (reflected and thus imaginary) other to the point of being nearly indistinguishable. We’re one but we’re not the same was produced for “Runge Heute: Konstruierte EmpfindungBeobachtbare Zeit” (Runge Today: Constructed SensationObservable Time), an exhibition currently on view at the Kunsthaus Hamburg that seeks to investigate the affinities between Philipp Otto Runge and contemporary artistsespecially with regard to the German Romantic painter’s insight into the viewer’s role as coproducer of the artwork. In an interview published in the catalogue to the exhibition (which was initiated by artist and theorist Michael Lingner), Timme speaks of experimentally taking up not only the primacy in early Romanticism of the act of viewing (the forever inconclusive process of perception, as opposed to the artist’s intention) but also Runge’s interest in making what traditionally lies beyond the frame, the parerga, into an integral part of any aesthetic object. Academic rules and artistic doctrines wereas Runge presciently recognizeddisplaced by a notion of aesthetic polysemy, predicated on the activation of the individual beholder’s faculties. The recognition that the emancipated or even participatory viewer continues to be the decisive a priori of art after modernism is central to We’re one but we’re not the same, as is the idea that this paradigm itself demands further reflection and is continuing to be transformed, not least in the wake of Michael Fried’s infamous horror at the “theatricality” of Minimalist sculpture in his 1967 essay “Art and Objecthood.” That is to say, Timme’s installation does far more than assert the longue durée of aesthetic principles that emerged around 1800. Rather, it explores the genealogy and present relevance of a specific form of aesthetic experience in which the viewer is bound to become, reflexively, other. In taking up such issues, Timme turns out to be an attentive and critical reader of the work of the philosopher and art critic Juliane Rebentisch, whose book Ästhetik der Installation (Aesthetics of Installation, 2003) brought the idea of “aesthetic experience” back to the fore of German-speaking discussions around contemporary art. In her discussion of this notion in the journal October in 2009, Rebentisch defines it as “a process between subject and object that transforms boththe object insofar as it is only in and through the dynamic of its experience that it is brought to life as a work of art; and the subject insofar as it takes on a self-reflective form, its own performativity recurring in a structurally uncanny . . . way in the mode of the object’s appearance.” Instead of merely illustrating such a theoretical explication, Timme’s current practice seeks to raise the question of how and to what extent art may reflect the particularity of the beholderan imperative already in place at least since the ’60sbeyond any idealized notion of a universal subject. Like Timme’s earlier piece 24 Bilder in der Sekunde (24 Frames per Second), 2007, in which a large rotating cylinder made of twenty-four mirrors transposes the illusionistic mechanism of cinema into a kinesthetic sculpture, We’re one but we’re not the same establishes a filmic dispositif without being bound to this medium in the strict technical sense. In a way that parallels the experience of actors in early cinema, the mirrors in the new installation disrupt the relationship between a person’s own body image and what is optically registered. The uncanny impression of the doppelgänger, which also haunts Romantic literature, thus enters the scene. The media theorist Friedrich Kittler has discussed the ways in which the initial phase of cinema posed fear of the doppelgänger as a “social-Darwinist principle of selection” that separated film stars from theater actors. It could be argued that today, under the rule of the “new spirit of capitalism,” self-reflection has become a universal necessity, a mode of self-relation everyone is compelled or coerced to perform. Film’s implicit logic, that is to say, has become a principle of social organization, as subjects are tested as actors in the role of themselves. Jan Timme, One, Two, Three, . . . , 2005/2010, color photographs, passe-partouts, overall 2' 4 3/4“ x 10' 4 1/4”. Herein lies the contemporary dimension of reflection in the figurative, as well as literal, sense. Timme’s piece therefore is characterized by an irresolvable ambivalence: On the one hand, the viewers, in that they do not incessantly and exclusively encounter themselves face-to-face, are temporarily relieved of the pressure to live up to a model image of themselves. However, each viewer is also burdened by the implicit control that results from being exposed to a gazeeven if the gaze is one’s own. This self-surveillance simply makes evident that the external demands have been internalized. Rebentisch has elsewhere argued that today’s dominant form of interpellation has changed the nature of the problem, so it is “no longer that of Oedipus, who wrestles with paternal law, but that of Narcissus, who has not grown into the ideal image of himself.” Timme’s installation of mirrors in turn emphasizes that the realm of the aesthetic is hardly a refuge from these conditions. It may, however, provide a way to negotiate these altered norms and explore the modes of their contestation. A reading of the work along such lines seems encouraged by a series of four black-and-white photographs of a Pierrot, hung on an adjacent wall as a constituent part of the work, at times also reflected in the mirrors. Each of these images, which consecutively grow smaller and richer in contrast, is a reproduction of the previous one; the first is itself a copy of Adrien Tournachon’s 1854 photograph of the mime Charles Deburau, which Timme found in Rosalind Krauss’s 1978 essay “Tracing Nadar.” In this image, Krauss writes, “the mime doubles in the roles of photographer and photographed. . . . The mime enacts the awareness of watching himself being watched, of producing himself as the one who is watched.” Far from enduring a form of social-Darwinist selection, the actor is here apparently in control of the situation. In Krauss’s interpretation, a self-reflexive construction of the subject stems from the fact that only the photograph, as a “logically unique sort of mirror,” is in a position to give rise to an “absolute simultaneity of subject and object.” Timme’s installation disallows even the distancing mediation of the photograph: Rather, he allows the ceaseless self-reflection in the very experience of an artwork to become at once manifest and strange in itself. Simultaneouslyas the work’s title, borrowed from Johnny Cash’s cover of U2’s song “One,” already makes clearthe prints of the Pierrot advocate a form of resemblance that is not identity. We’re one but we’re not the same is able to reflectas in a mirror, but also beyond the mirror’s edgeboth the aporias of any concrete address to a specific viewer and the perils of the relentless demands made on subjective dispositions, preferences, and skills as a social imperative of the present and its art. Precisely because our sense of self is modeled on the Romantic idea of the unfathomable plenitude of the individual, the contemporary subject is now caught in a hall of mirrors. André Rottmann is an art historian and critic based in Berlin.